Postmodern architecture is the name given to the dominant movement to arise out of the reaction to Modernist architecture. The Stata Center at night. A Postmodern building. Note the angle of the walls. Postmodern, like Modern, has meanings well beyond architecture, and it is helpful if we take a step back and consider its broader definition. First, it is a reaction to Modernism. Modernism was focused on science and progress and objective truth. Postmodernism questions the meaning of truth and progress. Second, Postmodernism is a worldview. Since it doubts the existence of a underlying truth, what we consider truth is based on the meta narrative which we ourselves are a part of. Since there is no truth there are only choices and preferences. Postmodern critical thought seeks to deconstruct these meta narratives and reconstruct them to a preferred state. The problem is that what is preferred isn’t necessarily better except in the context of some other meta narrative. Even our language is part of the meta narrative. In a Postmodern understanding of literature the text only has the meaning that the reader receives. The author’s intent is not considered. Some architecture is given the title " Postmodern architecture " to mean it has rejected modernism and includes ornamentation and pays homage to past forms. In other cases the title implies that the architect has based his work on a Postmodern worldview. It is this latter form of postmodernism,sometimes called deconstructivism, that I vehemently oppose. In that debate, Alexander, representing a return to traditional values in architecture, talks about the ideal of harmony and Eisenman extols disharmony. Eisenman lauds Postmodern architecture that creates designs that are disharmonious because this better represents man’s relationship with the world around him and shocks him into considering this reality. 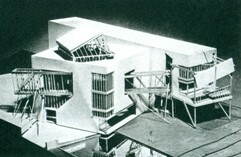 The debate put to words what Eisenman’s buildings put into practice. 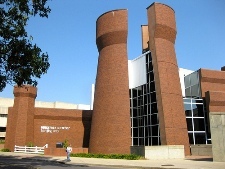 His Wexner Center for the Arts, in Columbus, Ohio is an excellent example of Postmodern architecture. If you think of a traditional building as being built to a grid, the Wexner Center is built to multiple, shifted grids. Walls are not parallel and perpendicular. This is disorienting, but from a practical matter it is also confusing. Getting from one place to another in the building is difficult and counter-intuitive. To borrow a term from computers, it has a confusing interface. Ravi Zacharias, the Christian apologist, arrived at the Wexner Center by taxi for a talk on the Christian worldview as opposed to the Postmodern worldview. Unaware of his purpose the taxi driver proudly informed him that the Wexner Center was the world’s first Postmodern building. Ravi quipped “Let us hope it was not built on a Postmodern foundation.” In a sense it was. Ten years after it was built the Wexner Center was closed for three years for $15 million dollars worth of repairs to counter basic design flaws that caused the roof to leak and allowed sunlight to damage art on display. 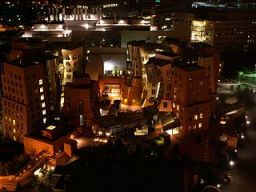 At the time of this writing, the star in the firmament of Postmodern architecture is Frank Gehry. He is highly sought after as his buildings become tourist attractions. In many ways they are fun and playful, and often don’t look much like buildings. He eschews the straight and rectilinear. His buildings curve, they lean, they sometimes look like they are about to fall down. Thanks to modern computer software they don’t. However there is a price to pay on the inside. Walls that lean, and floors that aren’t level create feelings of nausea in some people. but is also disorienting. It is visually stimulating, but would you want to work there? 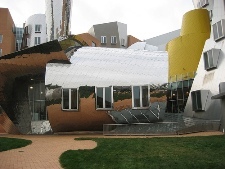 In his Stata Center at MIT the windows seem strangely proportioned, but it is difficult to say what is wrong with the windows, because they are leaning and meeting at unusual angles. In his InterActiveCorp headquarters building (see below) the walls seem to blur. The walls are bending and blurring and seem to be transforming. It is stunning, but it is difficult to imagine a city built on these concepts. 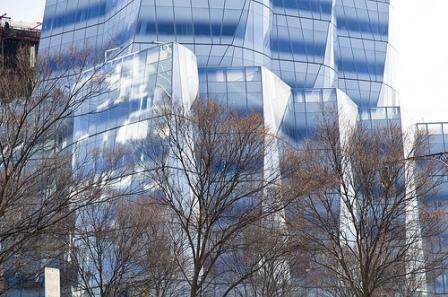 An occasional building as an iconic conversation piece is one thing, but replicating the same ideas with block-after-block of Gehry inspired buildings is unsettling to consider. The folks at Triangle Modernists Houses have a full page on Gehry's houses. This house was never built but this model was picked for a Museum of Modern Art exhibit as an example of the perfect deconstructivist house. Visit their site. I admit to liking three of his houses (guess which ones). Check out the one that looks like an abandoned warehouse, or the multiple houses he shrouds in chain link fencing. I prefer the eccentricity of Postmodern architecture to the predictability encountered in the Modernist International style of boxy buildings, but there is a better way. Remember that debate I quoted from, between Peter Eisenman and Christopher Alexander? Alexander is himself an architectural theorist and he espouses something called a Pattern Language. His ideas prove pretty useful when we consider the alternative to Postmodern architecture as a reaction to Modernism. We will look at this Pattern Language more closely when we take up the New Urbanists and a return to tradition. What do you think about Architectural Philosophy? What is your take on Classicism, Modernism, or any other major architectural movement? Add to our conversation. Tell us what moves you or what turns you off.